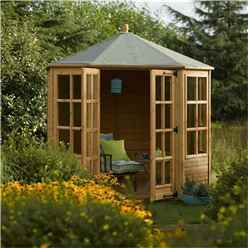 We have many Summerhouses to choose from – perfect to enjoy during the summer months. 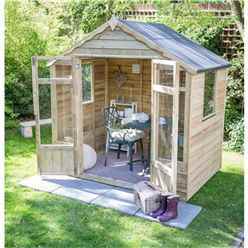 Not only are Summerhouses useful during the summer, they can also prove useful during the colder months for either storage or entertaining. 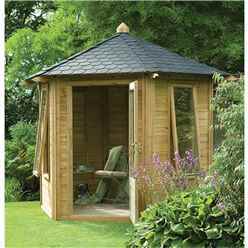 Summerhouses are popular for many reasons. 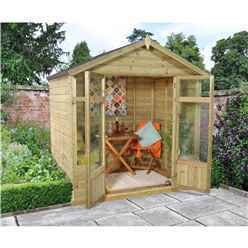 You may wish to add a table and chairs so you have somewhere nice and sheltered to enjoy your garden from or to enjoy after a sociable BBQ with friends to shield you from the evening breeze - or worse, insect bites! 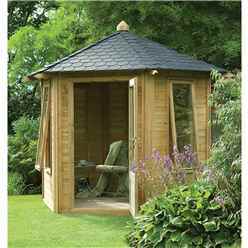 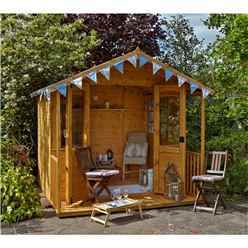 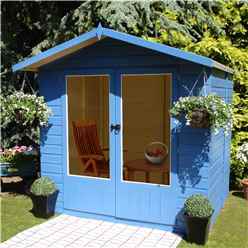 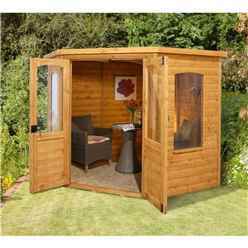 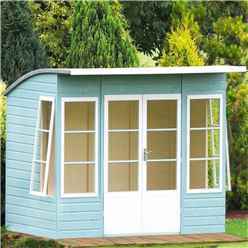 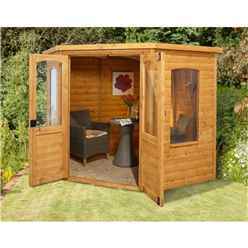 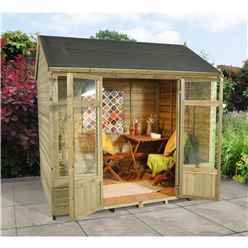 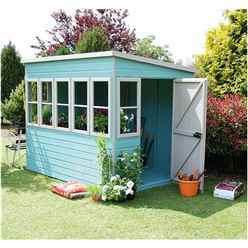 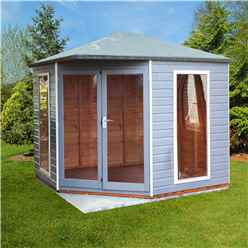 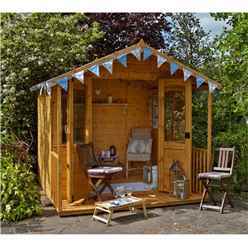 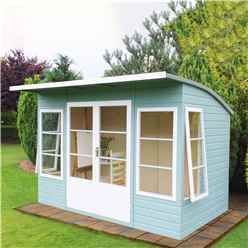 Maybe you would like to work from your Summerhouse, easily done if you add electrics, you can then dress the interior with a desk, a comfy chair and a filing cabinet. 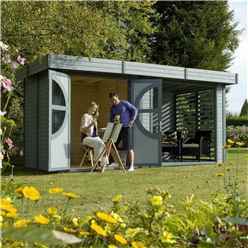 Put your own mark on it by adding your PC or laptop, some plants, your choice of art on the walls and coffee machine, not forgetting your favourite mug - you are good to go. 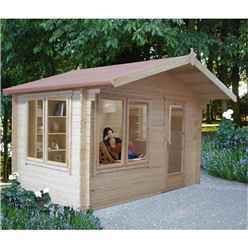 Maybe you would like a Summerhouse for somewhere safe for your children to hang out with friends. 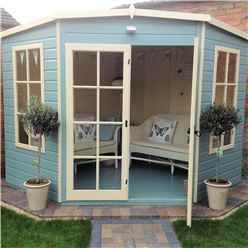 Add some nice chairs or a sofa, possibly a TV or dart board, or if they are lucky, a pool table. 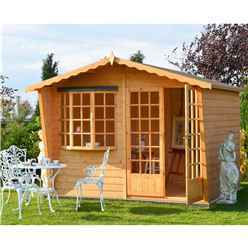 Perfect place for them to enjoy the company of their friends in the safeness of your own home. 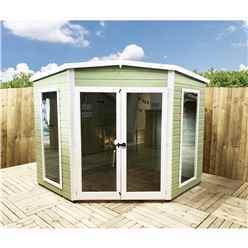 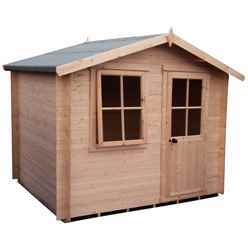 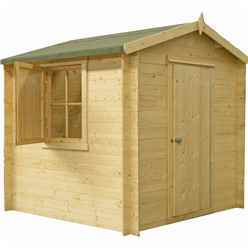 Our range of Summerhouses is huge and expanding all the time. 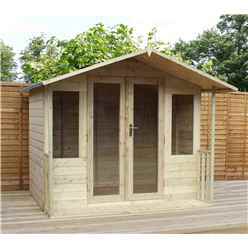 Sizes starting at the popular 7ft x 5ft going up to an impressive size of 18ft x 16ft. 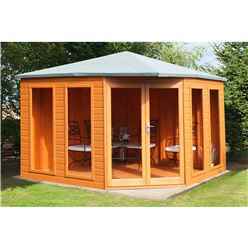 Shapes and designs differ so we are confident you will find what you are looking for. 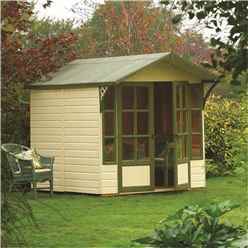 Many Summerhouses include an overhang creating some shelter over the front doors of your Summerhouse. 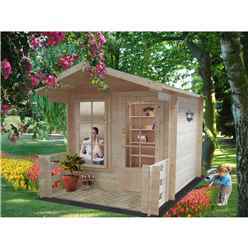 Others include a full veranda, creating a balcony-like feature to your cabin. 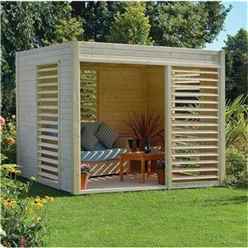 Perfect for sitting under to provide some shade on hot days. 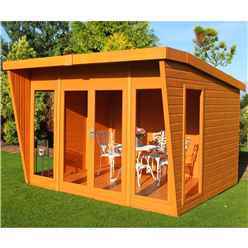 Summerhouses are available in overlap which consists of each panel of wood overlapping one another. 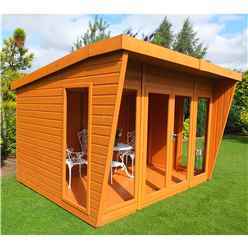 Or Tongue and Groove, which is where each panel of wood interlocks with one another creating a stronger, more durable building. 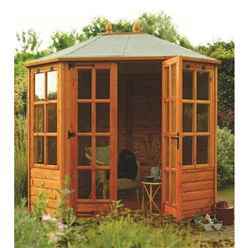 Tongue and Groove also creates a smoother finish to your Summerhouse. 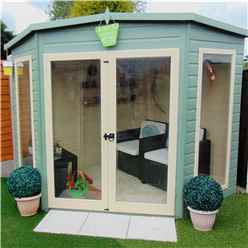 The choices of a single door, perfect to provide more inside space, a stable door which is a little different and great if you have pets which may like to enjoy the Summerhouse or the popular choice of double doors making it possible for you to fit larger items inside. 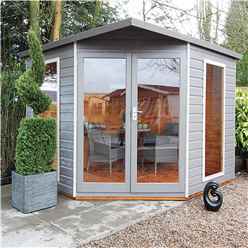 As the Summerhouses go up in size, the more options you have to choose from, such as, wall thickness – which is available in 19mm, 28mm, 34mm, 44mm or 70mm. 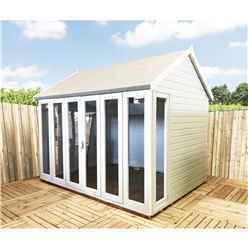 Each option is made on your own personal preference and is made dependant on what it is you intend on using your Summerhouse for. 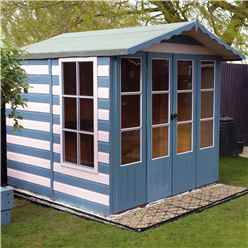 If you would like our advice regarding this, please do not hesitate to contact us. 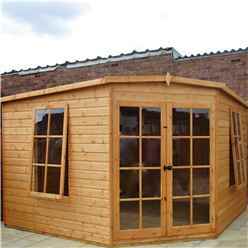 Another option for some Summerhouses is single glazing or double glazing for the doors and windows. 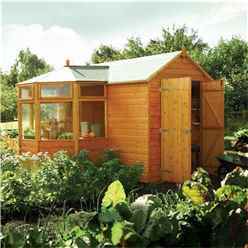 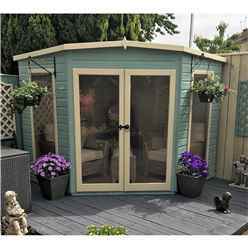 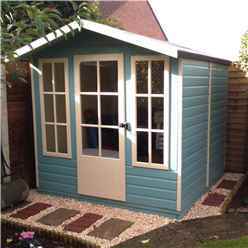 This option again, is based on your own choice and can be dependent on what you would like the Summerhouse for. 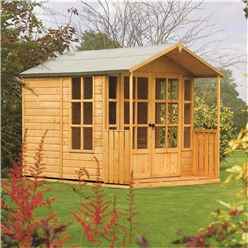 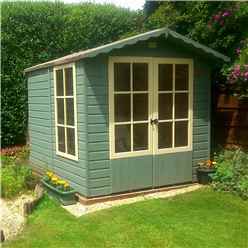 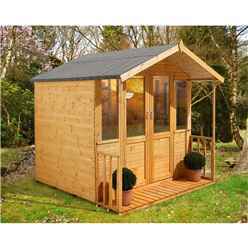 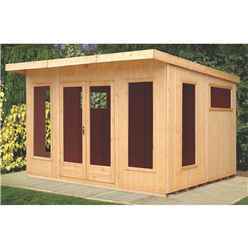 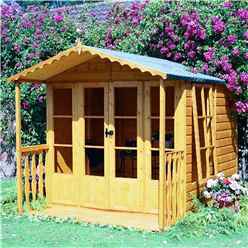 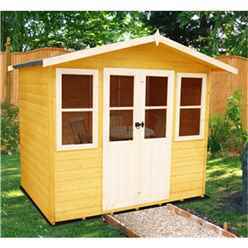 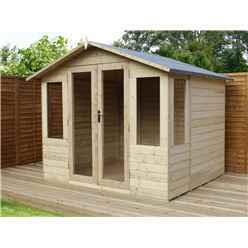 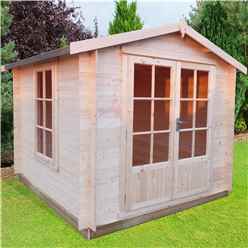 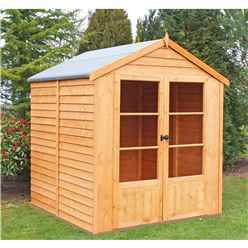 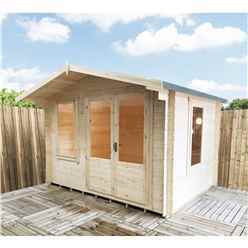 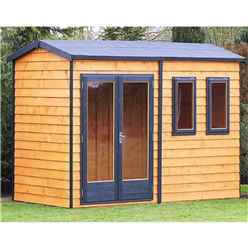 The Summerhouses listed on our website are listed in price order making it easier for you to find what is available in your price range. 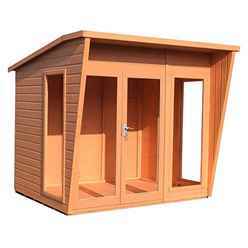 You can also search by size, narrowing your search to the size you require instead of scanning through products of no use to you. 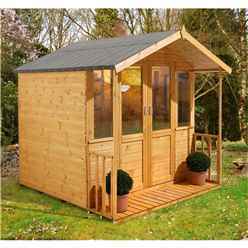 We are able to offer an exceptionally fast delivery for many of our Summerhouses and to book a delivery day that suits you. 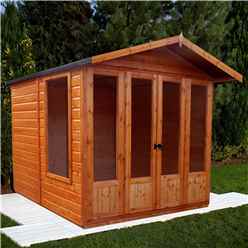 We understand the importance of delivering at a convenient time for you. 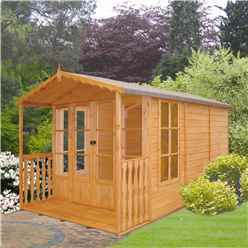 For some Summerhouses, the delivery may be slightly longer as some are made to order. 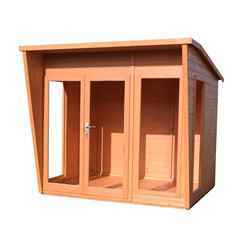 The made to order Summerhouses delivery time can vary from 2 weeks to 4 weeks. 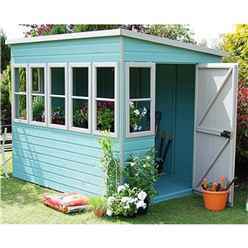 Though, you will always be contacted to arrange a convenient delivery date prior to your delivery. 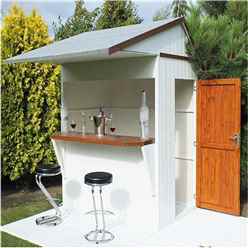 We will never turn up unannounced with your good. 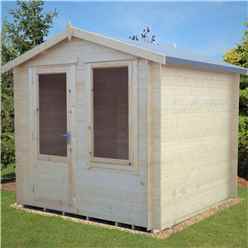 All of our products are delivered flat packed in pre made panels, so as standard, you would need to arrange the installation of your building. 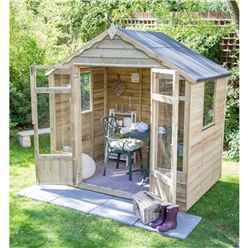 The instruction manual will be included with your delivery as will all the fixings, such as nails and screws you will require to carry out the installation of your new Summerhouse. 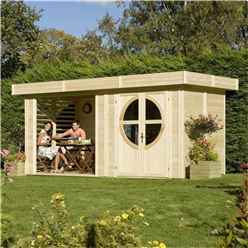 We would always recommend at least two people install the Summerhouses. 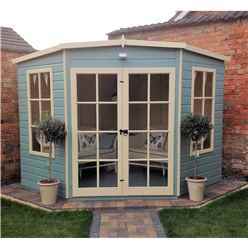 If you are concerned about erecting your Summerhouse, we do have an experienced team of installers which are available to you as an additional extra. 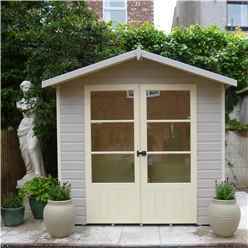 Whichever you choose, you must ensure you have an appropriate base for your new building. 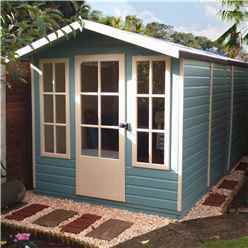 We recommend a solid, level, concreted or paved area which is big enough to situate your new building on to – if not, slightly bigger than your Summerhouse. 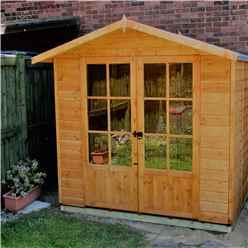 We would also advise you have a clearance space of at least 1 foot around the whole of your building. 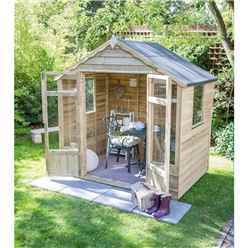 This makes it easier for you to carry out the installation and also makes it easier to be able to add treatment to the Summerhouse. 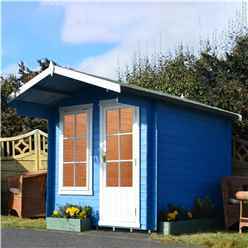 The majority of our Summerhouses are pre treated. 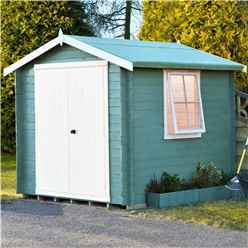 Pre treatment is to protect the building from the time it has been made, stored and then shipped out to you. 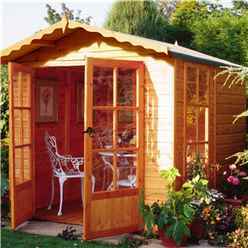 You would be then required to treat the building once it has been put up and do so once or twice a year, every year. 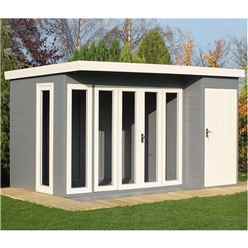 This is to protect your new building against poor weather and those cold, harsh winter months. 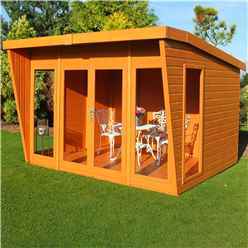 As wood is a living product, it is important you take care of your Summerhouse. 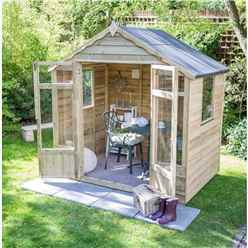 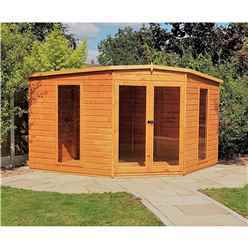 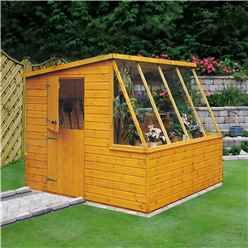 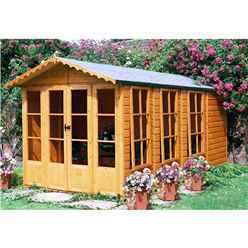 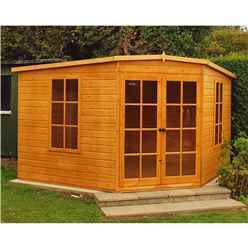 By looking after the wood of your Summerhouse, this will pro long the life of your new building and keep it looking as new as the day you received it. 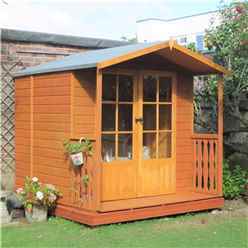 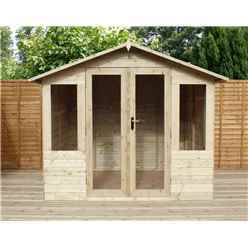 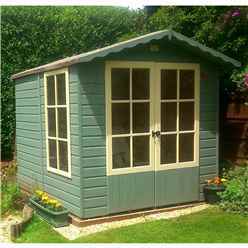 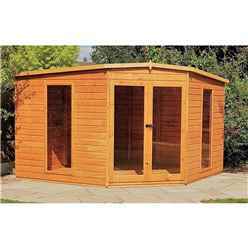 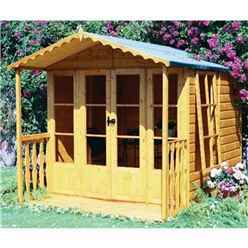 We have a selection of Summerhouses which have been pressure treated. 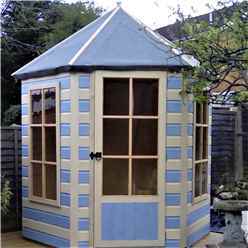 The pressure treated Summerhouses do not require further treatment – however, if you did desire to, maybe you would like to change the colour. 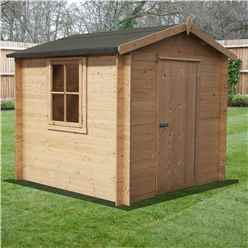 This isn’t a problem. 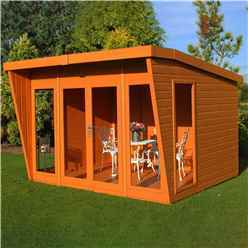 You just need to ensure you use a treatment for wooden outdoor buildings. 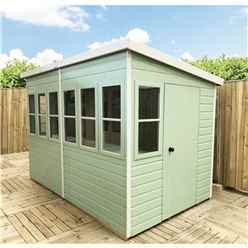 If you have taken a look at our range of Summerhouses and you find that you can’t find exactly what you are looking for, please do not hesitate to contact us by email or telephone. 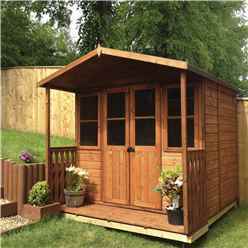 We are able to offer a bespoke service for these instances. 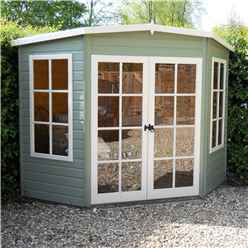 You just need to tell us the exact requirements you would like, whether it be an odd size, maybe an extra window or an extra door. Maybe you would like a separate room or two. 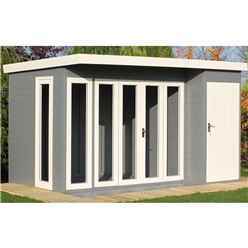 We are able to add partitioning walls with or without internal doors. 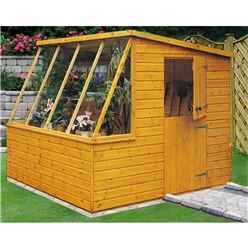 Maybe you would like to make just simple adjustments, such as just one extra window or just Georgian bars in the windows. 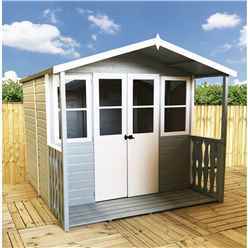 We can cater to all your needs and requirements.